Shanasheel, the Iraqi Cultural Festival for 2017 brings together Iraqis from their diverse religious and ethnic backgrounds to celebrate, engage and showcase their rich heritage and culture on Saturday 29 July at Casula Powerhouse Arts Centre. The program will feature talks and short-films about what is really happening in Iraq, and highlights of Iraqi culture and tradition with live performances, music, singing, dance, food and an Iraqi bazaar. The highlight of this diverse and rich program is insight into post-2003 Iraq by the visiting Iraqi filmmaker Mohamed Al-Dradji. After escaping to Europe where he completed his filmmaking studies and co-founded the multi-award winning Human Film production company, Mohamed returned to Iraq following the collapse of Saddam’s regime in 2003. There he made Ahlaam, an insight into the chaos and confusion of a war-torn Iraq following three decades of dictatorship – which screened at over 125 international film festivals and received over 22 awards – then he directed his two acclaimed films: Son of Babylon, the harrowing story of a boy’s quest to find his long-missing father just after the fall of Saddam Hussein’s regime in 2003, and In the Sands of Babylon, where the fateful climax in the killing fields of Babylon is revisited through unravelling the courageous and tragic secrets of three survivors of Saddam Hussein’s mass graves. He also co-founded an academy program in Baghdad where short films are written and produced by students under his supervision. While he was in Iraq, he was kidnapped by militias, detained by the US army and assaulted by Iraqi security force. “I am really excited about our program at Casula powerhouse Arts Centre this year” says Firas Naji, the Festival Director. “We are providing a unique opportunity to learn about Iraq firsthand from Iraqis themselves, not through a third party”. “Shanasheel in Iraqi refers to a traditional balcony in Iraqi architecture that connects the private home with the streetscape. We are hoping to do the same during our festival this year: invite our fellow Australians to share our stories, our culture and our traditions”. Canberra Says No an Australian premiere directed by Zahra Alsamawi and written by the award-winning Australian actor and writer Osamah Sami (the star and writer behind Ali’s Wedding, winner of the 2017 Sydney Film Festival’s audience ward) is a drama inspired by the 2001 tragic drowning of 351 asylum seekers on their way to Australian shores. The film is directed and written by second-generation asylum seekers who were raised, studied and practiced film-making here in Australia. Two men: an Australian navy officer and an Iraqi asylum seeker whose lives were shattered since the incident face each other in a mind game that turns tables and exposes the truth about what had happened as both men seek closure. Other films include The Boss by Rizagar Husen, Kurdish insight into how dictators are made from within. Jwan by Ali Al-Jabri, tells the story of a Yazidi woman’s ordeal kidnapped by ISIS. The Black Land, by Daby Zainab Faidhi, an Iraqi woman’s fairy tale animation about Baghdad, and Implant, by Ammar Barakat, snapshot of a migrant’s feelings coming to Australia. The program also includes a musical session with a collection of classical and folkloric Iraqi music, singing and dance reflecting the rich and diverse Iraqi cultures. 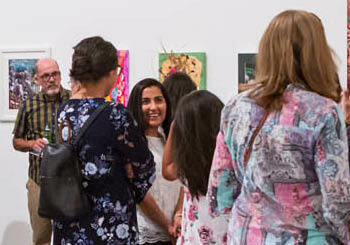 The Casula Powerhouse Arts Centre grounds will be transformed into an Iraqi Bazaar of stalls offering food, art, traditional handicraft, jewellery, giftware and more! With live Arabic calligraphy and henna tattoos. The festival will be at Casula Powerhouse Arts Centre on Saturday 29 July. Entry to the keynote address and the Iraqi Film Festival are free with registration.